Free Teacher Lesson Plans and Worksheets From the UK's top charities, museums and corporate organisations. Teaching Ideas and Resources for all UK Subject Areas Ideal for teachers of KS1, KS2, KS3 and KS4. Teacher Guidance, Classroom Activities, Video Footage, Interactive Games.... You can find all this plus more on this free teachers website. 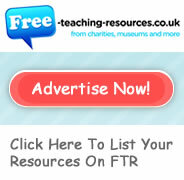 If you are a primary or secondary teacher looking for free resources this site can help you! It points you in the direction of brilliant free teaching ideas, lesson plans, worksheets and more. They are all produced by UK companies, charities and museums and galleries, and in many cases have been created by experienced educational teaching experts. We have done all the hard work by finding the resources, categorising them into KS1, KS2, KS3 or KS4 and making them subject specific. We have even added video clips and teacher reviews to help. This site is different to others in that it is a hand picked selection of the best classroom ideas and learning materials out there. You don't have to search through thousands of educational sites to get what you want. Welcome to Free-Teaching-Resources.co.uk, the website for teachers that features useful lesson plans and worksheets to help busy teachers save time planning. It can take hours searching for top quality free classroom activities to use in your school. This educational website has high quality material that has been written for UK schools. School budgets are stretched more than ever and the pressure is on teachers to deliver great exam results in a lot of cases without sustainable resources to deliver the curriculum. Free Teaching Resources UK can help teachers find great lesson plans, worksheets, assessment, tutorials, workshops and assemblies. We have gathered together all the best free resources available online into one place for your convenience. Simply click on the subject of your choice and follow the links to the material. So Who Produces the Lesson Plans and Resource Banks? Here are just a few of the organisationswho provide resources for our school teachers; BT, Action Aid, Battersea Cats and Dogs Home, BP, British Heart Foundation, Crimestoppers Trust, Jeans for Genes, Maths Wrap, National Archives, National Gallery, National Trust, NHS Careers, PDSA and many many more. Whether you are a primary key stage 1 or key stage 2 teacher, or a secondary key stage 3 or key stage 4 teacher, this site will have worksheets, and free teaching material for use in your classroom. All curriculum subjects are covered, plus teaching ideas for areas such as literacy, numeracy, SATS, GCSE revision, GCSE bitesize tips and many more educational resource tips including the best interactive resources in the educational marketplace. Free teaching resources can also be used for students studying AQA, edexcel, OCR courses. Go to the particular subject you are interested in and pick KS1, KS2, KS3 or KS4. You will also find material for SEN, diplomas, form time and assemblies. Looking for primary resources or secondary resources? You’ll find resources for Art and Design, Business Studies, Careers, Citizenship, Design and Technology, Drama, English, Enterprise, Geography, History, ICT, Maths, MFL, Music, PE, PSHE, RE, Science or Work-related Learning, Free Teaching Resources UK is the right place to be. Plus, we update our listings weekly so go to the blog and latest news to find out the latest resources on offer.